We all know about Miss Lovely, Gangs Of Wasseypur and Peddlers going to the Cannes. But apart from these three films, there’s a very important Indian film which will be at the festival this year – Uday Shankar’s 1948 classic film Kalpana. The restored print of Kalpana will be screened in the Cannes Classics section. The other important films in the Classics section this year includes Sergio Leone’s Once Upon a time in America, Roman Polanski’s Tess, Spielberg’s Jaws, The Ring by Alfred Hitchcock, David Lean’s Lawrence of Arabia and Runaway Train by Andrei Konchalovsky. Since we really don’t have a habit and culture of preserving our cinema, i was wondering how did this happen. Then through a common friend i got to know about ad filmmaker Shivendra Singh Dungarpur, who is instrumental in making it happen. I asked him to share his experience on the same and he happily obliged. Read on. I’ve been attending a festival called Il Cinema Ritrovato in Bologna, Italy for the last few years. This is a festival of restored films and it really amazed me what fantastic work they were doing at the restoration lab in Bologna. They work very closely with the World Cinema Foundation (WCF) headed by Martin Scorsese, who have been doing remarkable work restoring films from all around the world. Last year one of the representatives from WCF mentioned to me that they had been trying to get an Indian film called “Kalpana” directed by Uday Shankar for restoration. They had been trying for almost three years to get the film cans out of India, but they had not been able to do it for various reasons and they had given up. 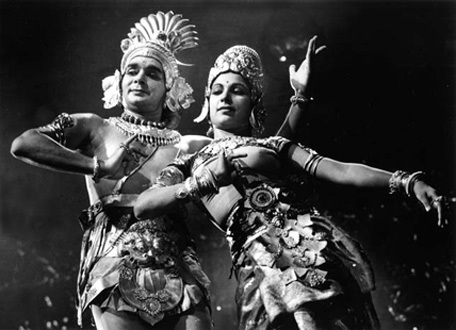 I had seen Kalpana at a private screening that I had paid for at the Archive in Pune and I knew it was an extraordinary film especially from the point of view of dance and the use of light. I promised the WCF that I would get the film for them to restore, but they were sceptical given their previous experience. Even I didn’t anticipate the extent that I would have to run from pillar to post for this. I knew the Shankar family and that I was working very closely with the National Film Archive of India (NFAI) for my documentary on P.K. Nair called “Celluloid Man.” I met Amala Shankar (Uday Shankar’s wife) in Kolkata along with her daughter Mamata Shankar and daughter-in-law Tanusree Shankar . I had to request them to procure a legal opinion from their lawyer as there was some litigation regarding the rights of the film that needed to be clarified before WCF could go ahead with the restoration. After a lot of persuasion and several trips to Pune, the NFAI also agreed after I showed them a letter from Martin Scorsese stating that I represented the WCF in this matter and on the condition that I took the onus of sending the cans to Italy and ensured their return. So in a matter of a few months, I managed to send the film to Bologna from my office in Mumbai. In fact, I am responsible for the negative. I’ve been hearing great reports on the restoration and the lab in Bologna worked round the clock to ensure that they could premier the restored version of Kalpana at the Cannes Classic section. The WCF have very kindly invited me and Amala Shankar for the premier and we will walk the red carpet at 6.30 p.m. on May 17 before the premier. Amalaji is 94 years old and she is thrilled to travel to Cannes and walk the red carpet to see the only film made by her husband in which she played the main role. At Cannes I have also been invited to see the restored version of Sergei Leone’s “Once Upon a Time in America”. As I am a donor for the restoration of Hitchcock’s film “The Lodger”, the British Film Institute has invited me to a screening of their restoration of Hitchcock’s silent film “The Ring” with live accompaniment. In the West, there is a strong culture of preservation and restoration of films that India completely lacks. This is a shame given what a great cinematic history we have. This is what inspired me to make my documentary “Celluloid Man” on P.K. Nair, the founder of the National Film Archive of India. Mr. Nair singlehandedly built the Archive. It’s thanks to him that film students from the Film Institute, Pune like me had the opportunity to see the work of great filmmakers like Ozu, Tarkovsky, Fellini, etc. My film is a tribute to Mr. Nair and his life’s work and somewhere I hope people will realize how important it is to collect and restore our films. One of the main reasons, I pushed so hard for Kalpana to be restored is that I am hoping that other Indian films will also get chosen for restoration. As a matter of fact, the lab in Bologna wants to restore Ritwik Ghatak’s “Meghe Daka Tara” and have asked me to help them raise the funding. I am hoping the Indian film fraternity or corporate houses will come forward so we don’t have to rely on the West. Now we all need to rally around to help get Meghe Daka Tara restored. Any ideas? thanks for minai’s blog. awesome articles there! This news is amazing. I have a friend called Tom Daniel who restores films as a hobby. He has restored Sikander, Achut Kanya and Mujhe Jeene Do recently. The change from the original messy print and the restored one is simply amazing. Our sincere thanks to you, for all the trouble you have taken for restoring Kalpana. WCF has also restored “titash ekti nadir naam”…hearty thanks to Scorsese. First of all we have to choose and select phenomenal films which have got only one positive print or negative and do our best to restore them in whatever way we can. Barin Saha’s only film “Tero Naadir Paare” [Bengali] is one such film which has only one print [a 16mm, in Nfai]. Being a student of cinema, I feel It has to be restored immediately..without a second thought. “Anand Math” [Hindi] can be another one. This is an amazing initiative. Thank you Mr Dungarpur for your immense efforts and thank you for moightclub for bringing it to our attention. Now for collecting funds for the restoration, why can’t we do something like the blogathon they have written about here? Yes, I know many Indians are laggardly when it comes to “donating” but surely there are enough cinephiles who would care to contribute for a cause. At least we can make a beginning. I can join in the blogathon though I am by no means a “knowledgeable” film expert, I learn everyday and hope to know a lot more than I did. Thanks a lot for the song promos,loved the hunter song. Important question : When is the soundtrack releasing ? Woh bhi इस सावऩ ? ‘kalpana” been done???? or is it only with the people who thinks only they know what gr8 things mean???? ?.an honest comment to get an equally honest replly nt wth reluctance as you never know may be i come to a lot of use regarding this..its my reality check…dfntlly i’m also related to performing arts…..regards.PIQLOO.